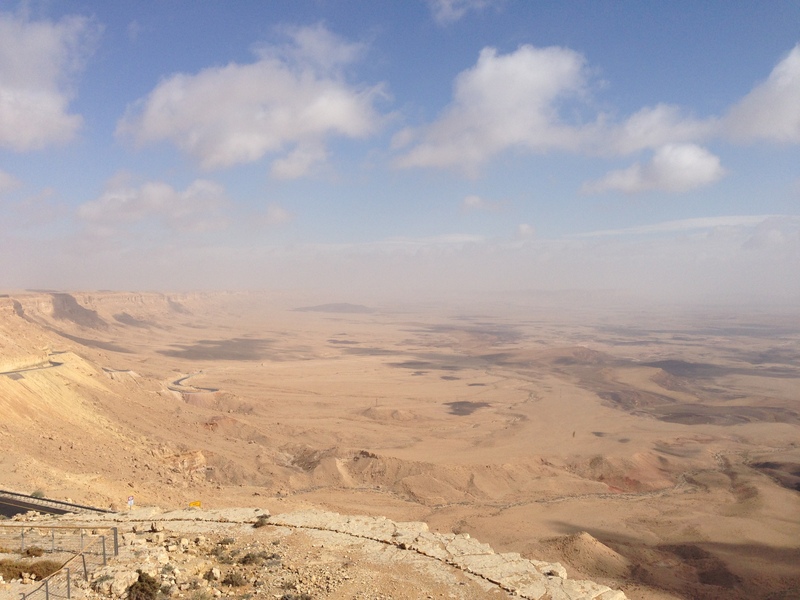 Looking for a natural wonder that’s rugged in it’s a beauty, and doesn’t exist outside of Israel? Then head to Mitzpe Ramon, where you can get the unique opportunity to see the Makhtesh Ramon, erroneously known as the Ramon crater, is a large geological feature located in Israel’s Negev desert. The Makhtesh is a large crater for lack of a better word, that was formed by the receding of oceans and rivers changing course and carving out the softer interior rock to form the Makhtesh. The Makhtesh is famous for certain rock formations like Ha-minsarah, translated in English to Carpentry, because it looks like wood chips. There’s something so holy and spiritual about the place, it’s incredible. It’s as if you can feel G-d in the wind around you. See His hand in the fabulous colors of sand the Makhtesh is famous for, and the spectacular views that stretch for miles. While I wouldn’t recommend going in the winter like we did, as the weather is kind of unpredictable, I definitely would suggest you head over and check out this incredible natural wonder. As mentioned above, Mitzpe is a one pony town. 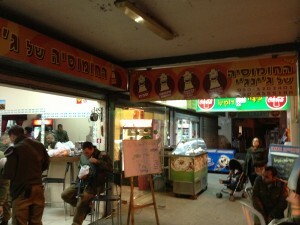 There is only one small shopping area with kosher food, although there is definitely a nice selection considering the size of the place, There is a shawarma restaurant, a pizza place, a hummusia, and a sandwich shop, as well as a Supersol supermarket, which has mainly kosher items, as well as fresh fruits, vegetables, and baked goods. We had the shawarma for dinner for our one night there, and we both agreed that it was the best shawarma we had our whole trip. It is worth noting that the kosher restaurants here are not Mehadrin (at least they weren’t when we were there) but are under the local Rabbinate. 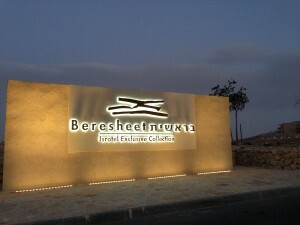 There is plenty to do in this part of Israel. From hiking and biking, to farms there’s lots of family friendly fun to be had. My son’s favorite activity was the alpaca farm. They have Alpacas, llamas, goats, sheep, and lots of sheepdogs. Its a great place to take the kids and they also have a room where they show you how they separate the alpaca wool, make it into yarn and the use it to weave all sorts of deliciously soft cold weather staples. This farm also offers guide led horseback rides in the crater, that were not feasible with a two year old but sounded awesome. Another fun thing to do is rent bikes and bike the trails, or put on your hiking boots and work up a sweat taking the trails and seeing the gorgeous colors and vistas. 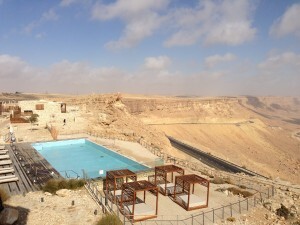 Mitzpe Ramon is a pretty small resort town, although they do have several places to stay. Ranging from the incredibly luxurious, to the economic and spartan. At the top of the heap is Isrotel’s amazing new offering Beresheet. This hotel is pretty spectacular. 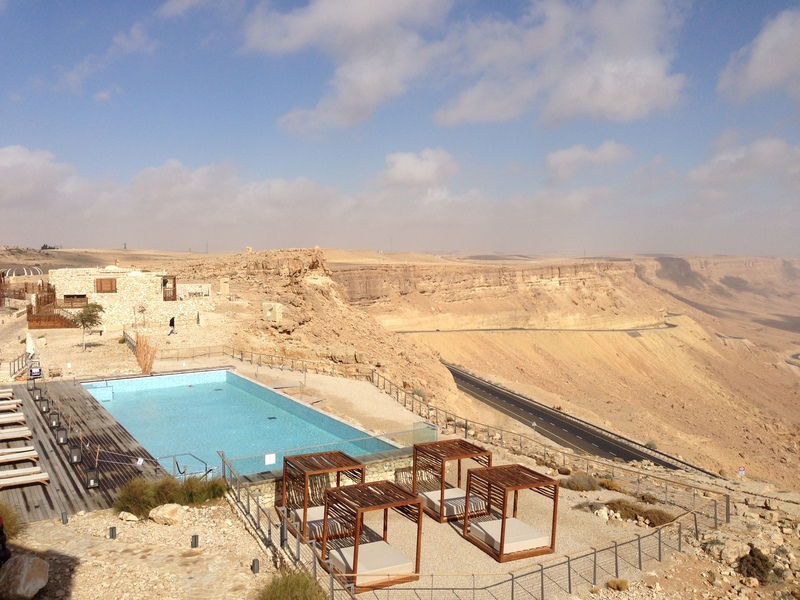 All the rooms have views of the Makhtesh, the hotel is literally built into the edge of it. The hotel has every amenity possible, from a fantastical pool that is both indoors and out, multiple dining rooms, spectacular lounge areas, outdoor spaces, a gym, and a spa, as well as a special area for kids. Unfortunately it was booked when we were there, but if and when I go back that’s where I hope to stay. If you’re traveling with larger group or for a longer stay, Ramon Suites is a fantastic option. It’s a clean and cute hotel, with large spacious suites that are great for families. Our suite has a spacious living room with kitchenette, and a separate master bedroom. Both rooms have TVs (great for entertaining the kids) and a nice functional bathroom. Delicious buffet Israeli kosher breakfast is included in the price.